An ode to borrowed items, jokes about parents, and Sis's center of "totally getting me." 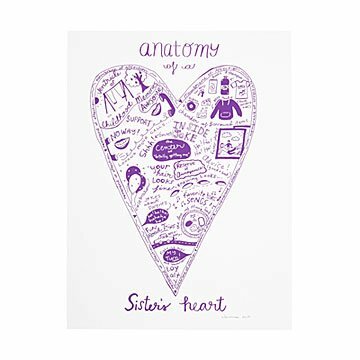 Celebrating the full picture of sibling life, this screen print features Sandra Dumais' playful heart illustration that offers a refreshingly honest look into sister-ism. Inspired by her own family experiences, Sandra hand sketches, paints, and digitally draws a narrative interplay of words and images. The result is an ode to borrowed items, jokes about parents, and Sis's center of "totally getting me" that makes for a positively charming character study. Handmade in Montreal.